"Ramirez's muy caliente debut introduces Dolores "Lola" Falcon Cruz, a Sacramento, Calif., PI whose kung fu moves are only part of her chica charm. A missing persons case--the disappearance of 42-year-old Emily Diggs, who left her six-year-old son, Sean, stranded at school--turns into a murder investigation after a boater finds Emily's body near Riverbank Marina. Lola's old high school crush, Jack Callaghan, now a Sacramento Bee reporter, provides some unexpected help. Emily had approached Jack about her 18-year-old son Garrett's recent death--from what Emily believed was a "heart infection" due to a faulty tattoo. Lola's determined to uncover the facts and catch the killer, even if it means, gulp, getting a girly belly-button piercing. Ramirez keeps the action tight, the plot smart and humor light in this spicy blend of crime solving and romance. 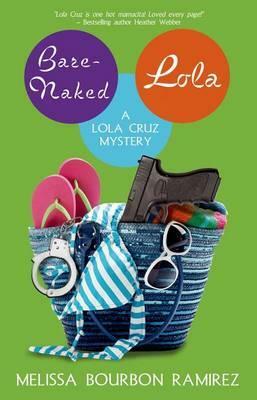 Lola's Latina perspective adds extra sizzle." - "Publishers Weekly"
4 1/2 Stars: "Tightly plotted, with scenes of laugh-out- loud humor, great dialogue and supporting characters, this is a sassy, fun story that will have you waiting impatiently for the next book." - "Romantic Times Book Reviews"
Melissa Bourbon Ramirez is the author of the Lola Cruz mystery series and A Dressmaker's Mystery series for NAL. She is also the coauthor of The Tricked-out Toolbox: Promotion and Marketing Tools Every Writer Needs, as well as the author of two romantic suspense novels, all to be released in 2012. Melissa is published in Woman's World Magazine, Romance Writers Report, and GLOW Magazine, and has a children's book published. A former middle and high school teacher, this blonde-haired, green-eyed, proud to be Latina-by-Marriage girl loves following Lola and Harlow on their many adventures. Whether it's contemplating belly button piercings, visiting nudist resorts, or hanging out with seamstresses and goats, she's always up for the challenge. She fantasizes about spending summers writing in quaint, cozy locales, has a love/hate relationship with yoga and chocolate, is devoted to her family, and can't believe she's lucky enough to be living the life of her dreams.